Wishing everyone a great night tonight, if you are celebrating, and a happy 2005. "From the Mediterranean bed to Kom Al-Dikka, from Akhmim to Sinai, from the Egyptian Museum in Cairo to Basle and Germany and from auction halls in Europe and America to Egypt, there were several exciting archaeological events to highlight this outstanding year." Al Ahram weekly's review of Egyptology through 2004 - the good and the bad. "Culture Minister Farouk Hosni will re-open the Pyramid of King Chephren in Giza as of Saturday after the completion of restoration works. In statements, Hosni said the third Pyramid of Mycerinus will be closed for a year to start necessary rejuvenations, adding 2005 will see a giant restoration project to restore King Chephren's funerary temple and the stone blocks in the area south of the temple. These steps fall within a plan by the ministry and the Supreme Council of Antiquities (SCA) which started in 1995 to preserve the Giza pyramids through regular restoration activities, said Hosni". And More on the Faiyum Granaries! The only additional news contained in this item is that the granaries contained dried cereals, fruits and flax. Which cereals and fruits I hear you cry! I'll let you know if I find out. This article contains some more information about the Faiyum Neolithic discoveries by UCLA, and also discusses archaeogy in the Suez Govenorate of Northern Egypt. As usual with the State Information Service, this is not the most lucid of descriptions, but it is more detailed than usual. An overview of the problems with items going missing from the Cairo Museum and other storage facilities in Egypt. According to the article the last full invetory of the museum's basement storage was taken 71 years ago! "The Daftarkhana, or what is today known as Dar El-Kutub and the National Manuscript Center, celebrates its 175th anniversary in October. An international conference will be held in honor of the occasion and should include discussions about manuscript preservation laws and techniques. While eating in a Zamalek restaurant, Supreme Council for Antiquities head Zahi Hawass discovered the cover of a sarcophagus dating back to the modern dynasty. The antiquity was simply lying there, and no one was able to tell him how arrived. Hawass promptly ordered the cover moved to the antiquities storerooms in Matariyya. Twelve years after a French expedition discovered the tomb of Bet-Shoo, the SCA has finally signed off on the expeditions request to piece together the Dakhla-area antiquity. Meanwhile, another tomb was recently discovered in the most unlikely of locations: Ard El-Naam (Ostrich Land) in Ain Shams. The beautifully decorated tomb is surrounded by moist ground, leaving the SCA to research ways of opening it without ruining the delicate reliefs and drawings inside. Water is also proving a challenge at Qenas Esna Temple, where the infiltration of underground water has the SCA planning to commission a Dutch company to tear the temple apart, raise it above the water level, then piece it back together. Finally, the War Path of Horus has long been the subject of debate. Was it a myth, or historical fact? Only a handful of the 11 forts said to mark the ancient protective boundaries delineating Egypts territories have been discovered. Last month, three new forts believed to have been a part of the path were unearthed north of Ismailiyya, where they are thought to have marked and protected the kingdoms eastern borders. SCA officials are ecstatic, saying they believe the forts could shed new light on the military logic of the ancient Egyptian." Reading between the lines of this somewhat confusing article I am guessing that a predynastic mural found at Helwan has been returned to Egypt, having been smuggled out of the country and sold off at auction. Hawass's "Dig Days" column is devoted, this week, to Egyptian writer Anis Mansour, and his involvement in Egyptology. Chicago Natural History Museum's digital x-ray analysis of a mummified cat revealed that it was a 500 B.C. fake - although the mummy has the form of a cat, there is no cat on the inside! The article discusses the museum's other uses of digital x-ray and why this technology is so useful. I won't be updating again until the 27th December, so please check again then! The New York Metropolitan Museum has refused the Tutankhamun exhibition which will be touring the US next year on the grounds that it has a 17 year tradition of not charging for special exhibitions. The admission fee being charged by Egypt is to be used to finance restoration and other work in Egyptian archaeology, but the Met believe that it is contrary to their own policies. 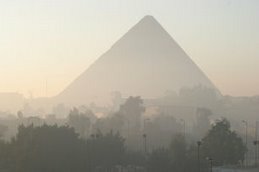 A new company has been established in Egypt to combat Egypt's inability to pay for conservation, restoration and excavation programmes: "The company is designed to generate revenue for the Supreme Council of Antiquities (SCA) to enable it to better invest in archaeological excavation and restoration, promoting archaeological and cultural awareness among the public, diversifying archaeology-related professional services, and producing high-quality commercial products". This fascinating article examines the new company, its objectives and its activities. It also says that professional photography will be completely prohibited in museums and at sites, but educational photography will be free. It makes no mention of ordinary tourist photography, so things are still clouded on that subject. "Monuments and tourism police seized in Menia governorate three rare ancient pieces dating back to the pharaoh era including a human head made of alabaster, from a farmer and a grocer before they sold to monuments merchants. " I posted about this on November 9th, when Radio Netherlands published an article on the subject at http://www2.rnw.nl/rnw/en/features/science/10631355. Okasha el Daly's work identified that Medieval Arabic scholars came to a number of extremely astute conclusions about ancient Egypt. This Discovery Channel further discusses the fact that the medieval writers concerned described Cleopatra in terms of her intellectual achievements, admiring her for her work in mathematics, science and philosophy. The article adds that Okasha's new book is coming out soon, describing his findings in detail. "Egyptology: The Missing Millennium, Ancient Egypt in Medieval Arabic Writings," will be published in January by the University College London Press. This disturbing article concerns the theft of 57,000 artifacts from antiquity warehouses. The acused officials are thought to have been part of a gang that the government now accuses of stealing and smuggling thousands of items abroad. Archeology Online's Interactive Dig has been updated with the latest from the important site of Hierakonpolis. It concerns that only upstanding structure at Hierakonpolis, the so-called "fort", built by King Khasekhemwy, the last king of the Second Dynasty (ca. 2686 B.C.). As usual, there is a lot of fascinating information in this article. It is necessary to page down to about half way down this page, which shows a number of reviews. The show described is Rameses - Wrath of God or Man - it offers a critique of the programme, starting with the words: "Bones from Egypt's Valley of the Kings are a sure-fire attention getter, but a big budget and lots of computer-generated images are not guarantees of a great program as the Discovery Channel's heavily promoted Rameses: Wrath of God or Man shows. Here, what could be an interesting, if less ambitious, documentary about trying to identify the human remains from KV 5 is hijacked by the biblical tale of the plagues and Exodus." It goes on from there. "After researching the pyramids of the Giza Plateau and their imposing half-human, half-animal guardian for 20 years, Vassil Dobrev of the French Archaeological Institute in Cairo has concluded that the Sphinx was the work of a forgotten pharaoh." The forgotten pharaoh in question is, in fact, Khufu's son Djedefre, who is not exactly forgotten, just not much mentioned. From the information in the Independent article, it all looks highly speculative. A chatty description of a Pittsburgh archaeological 3-D modelling project, and in partifcular the funerary mask of what may have been a noblewoman from the court of Ramses the Great which is physically on display at the St. Louis Art Museum. As well as other mummies dating to the late periods in Egypt, the tomb of a Governor of the oasis Bahariya has been found, dating to around 500BC. His sarcophagus was made from limestone which would have had to be transported from a considerable distance (around 62km). Hundreds of mummies have already been found, and it is estimated that upto 1500 may be the full number occupying the cemetery. "The Supreme Council of Antiquities (SCA) will embark within few days on carrying out an emergency project to rescue the ancient sun boats, dubbed "Cheops" in the Giza pyramids area. The boats have been badly affected by the strong sun, especially by the ultra-violet rays which damage the organic components of the wooden hulls." "In ancient times Lake Mareotis was a pleasure resort and watering spot surrounded by market gardens. " Al Ahram Weekly article about the occupation of Egypt in the Greek, Roman and following periods. The site of Tel Basta in the Shakira area has been scheduled for rescue activity. This follows the discovery and restoration of Princess Merit Amoun, the daughter and wife of king Ramses II. An Egyptian team working in Bahariya has found more golden mummies, similar to those found in the widely publicised "Valley of the Golden Mummies" found previously in the same Western Desert oasis. This extremely short article suggests that new material has been found to support the idea that the Western Desert was occupied 8000 years ago - at a place called Toshka. I'll see if I can find out more about it. Zahi Hawass uses his occasional column in Al Ahram to talk about visiting the house of Champollion in Grenoble, the value of his translation of the Rosetta Stone, and the good relationship between Egypt and France in spite of the current fracas re two french architects requesting access to the Great Pyramid for investigation of a potential new chamber. Article about Miroslav Barta's newly published study, entitled Sinuhe, the Bible, and the Patriarchs, is based on the famous ancient Egyptian fictional account, the Story of Sinuhe. The tale only survives in fragments, and has been pieced together over the years. Al Ahram discusses the orginal tale, looks at how Barta went about studying it, and describes Barta's book as follows: "The book begins with a full translation of the Story of Sinuhe based on the hieroglyphic translations of two papyri in Berlin, which were acquired in Egypt by Karl Lepsuis in 1842-45. This is followed by a commentary on the story. The next two chapters explain the political history of Egypt and Syria-Palestine so as to elucidate the background to Sinuhe's flight. Further chapters set out the latest developments in archaeological exploration in these regions -- including contemporary epigraphic sources -- and their interpretation by various scholarly disciplines, including Egyptology, cuneiform studies, the archaeology of the Ancient Near East, and the anthropology of nomadic populations." "Using computed tomography (CT)and 3-D modeling, radiologists are assisting in the restoration and display of a 5,300-year-old Egyptian mummy mask. This is the first time that CT and 3-D modeling were used to study, preserve and display an antiquity with an outer and inner surface, according to research presented today at the annual meeting of the Radiological Society of North America (RSNA). " A bronze bust of Ptolemy of Mauretania, grandson of Anthony and Cleopatra and last of the Ptolemies is going on sale at auction. Ptolemy was the son of Cleopatra and Anthony's daughter Cleopatra Selene and the King of Mauretania, Juba II. He was murdered in Rome by the Emperor Caligula. The portrait depicts Ptolemy at approximately 15 years of age and it is thought that it was done while he was in Rome to receive his education.